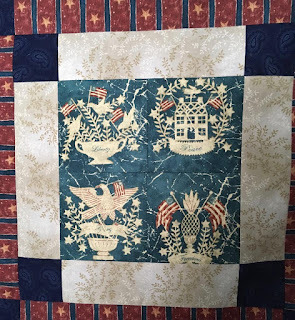 Colonial America is the first Quilt of Valor for 2018. The center block motifs are all colonial images with an odd hue of blue for the background. These blocks have been marinating for a long time because I couldn't find anything to coordinate with the blue. I finally decided to add a frame around the blocks to allow the blocks to "float." The striped fabric not only separates the blocks, but draws the eye away from the contrasting colors. 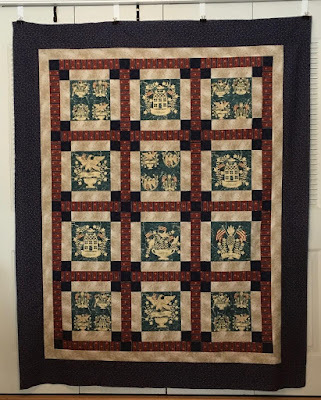 The center squares were fussy cut from backing scraps and the tan sashing is also from quilt backing scraps. The striped sashing and navy blue came from my fabric stash. I had seven blocks with a large, single motif and pieced some smaller motif scraps into blocks to have twelve blocks for the quilt top. That is a clever way of transforming the blocks. That colonial print is pretty, but you are correct that the blue would be hard to blend. You managed to pull off another beautiful quilt! I love the special touches you have taken the time and care to instill. So pretty! You are right, that shade of blue could be difficult to match (though I really like the shade). Another beautiful finish Nancy! You took a busy busy print and made it very visually calming! Nancy, I was gifted that same fabric, only I'm not as creative as you, I used it for backing a QOV!! I am very, very impressed with this quilt. I think it will be well appreciated by its eventual owner. 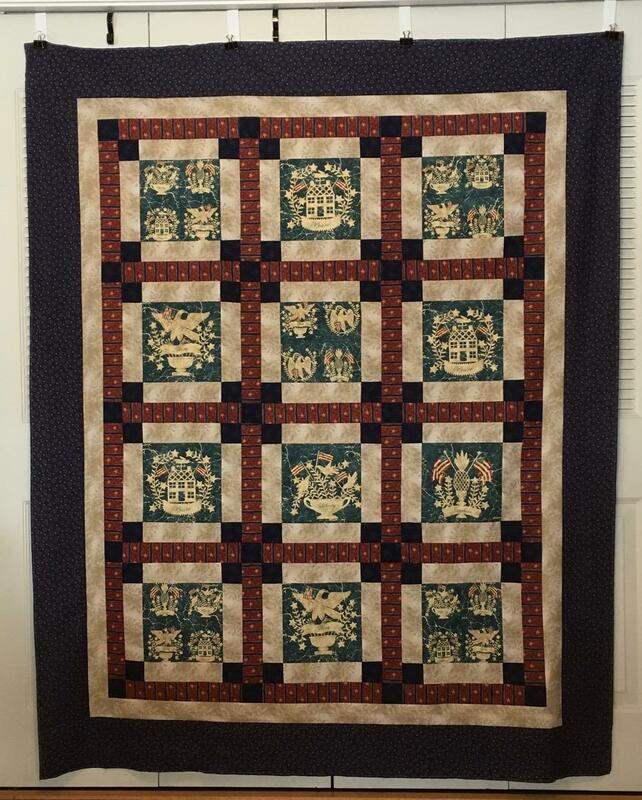 Your colour contrasts and layout have made a scrappy quilt into a little beauty. A great quilting start to 2018! I like hearing how you decide to layout the squares. Great job using those difficult blocks. So how many years have you been making these quilts? 129 quilts is an amazing number! Congratulations. Very different from the ones you have done before. I'm sure that made it interesting to sew. It looks great Nancy! A veteran will love it!